Looking to add a little spring “pop” into your beauty look? 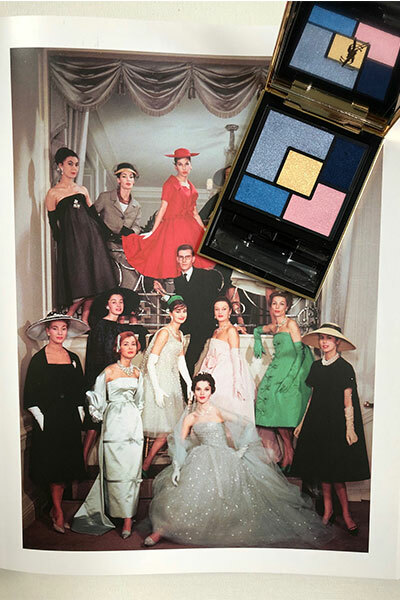 I’ve saved one of my all-time favourite YSL Couture Collector palettes to give away on my website. 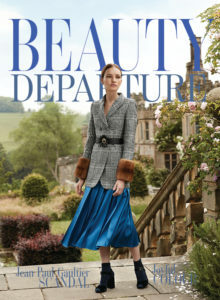 This 5-colour eyeshadow palette (from the spring 2018 collection) contains a trio of blue hues from soft lilac to azure to deep indigo – three modern ways to wear blue. Add in a gold highlighting shade and a soft pearl pink for an accent and you have a wardrobe of shades that will take you through spring and into summer beautifully. What’s interesting about this palette is the colours were carefully chosen to contrast, clash or complement according to how they are applied. The solar gold shade can be used as a gentle wash of colour for a soft spring look. Or it can be used as pop of acid brightness. I’m so appreciative that the YSL design team tests all these shades on a wide variety of skin tones to make sure they work for all. The colours are tweaked and perfected until they flatter almost every skin tone. 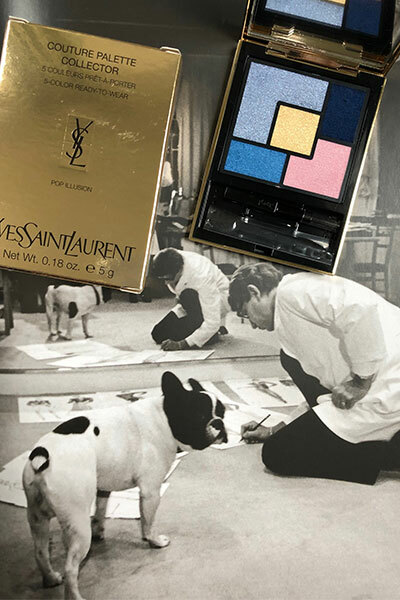 Here’s the palette with a photograph of Mr. Yves Saint Laurent sketching with his beloved dog Moujik. This photo is Mr. Saint Laurent who designed the Dior 1958 collection following the sudden death of Christian. It’s models wearing his “Trapeze” collection. 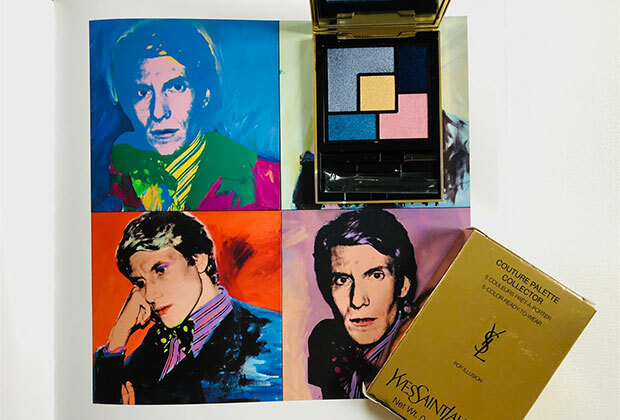 The Giveaway: I gave away YSL’s Couture Palette Collector in “Pop Illusion” to one lucky reader. To enter, I asked readers to tell me in a blog post comment below how they’d rate this palette on a scale of 1 to 10. Heidi C told us and we drew her name from all entries. Congrats Heidi! 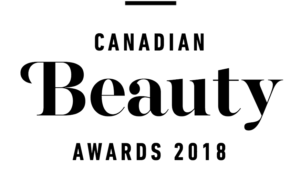 YSL Beauty is available in Canada at Sephora. 10/10 Such great colours! These would be wonderful for a night out! 9/10! Def would wear these shades! Love the blue shades. Definitely 10 out of 10! I would rate it a 10 and yes, I would wear these colours!!! I am blue eyed and have worn every shade of blue along with shadow, liner and crease since 1975. Always a hint of pink or yellow below my brow bone. 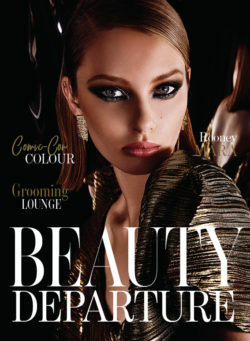 Always brown mascara or brown extentions. Still wear YSL Rive Gauche. Personally I would rate this palette a 10 out of 10. I just love this combination of bold a flattering colours. I love the engenuity of how the colors can be used in different ways – very much like my personal wardrobe style these days! Love the vintage photos of YSL and his French bulldog too!❤???????????? Definitely 9 out of 10. The only reason it isn’t a 10 for me, is because I wish there was an intense silver to go with those gorgeous blues. I would definitely wear every shade in this palette, stunning. Very pretty stylish colors there! Definitely a 10!!! It’s lovely. 10. My nie would love the bold colors. 10/10, I love it, it’s so fun ??? ?